Nothing like a little knock to your confindence on your birthday... but I am going to post the site anyway and you can practice and try for yourself. There is a button to share your score, but I won't be sharing mine. Not at least until I can practice to improve. Via Miss Erin I present to you: 10-fast-fingers.com. This has nothing to do with books, but it does have to do with writing. It is brought to you by Fuse #8. You have never seen anything until you have seen the reviews for Tuscan Whole Milk on Amazon.com I mean, seriously... do not attempt to drink any Tuscan Whole Milk while reading the reviews. I know there are somewhere in the neighborhood of 976 reviews, but it is well worth the effort. P.S.- REAL book review to follow soon. I have been tagged by A Year of Reading for a fun little Meme. (Do you since any sarcasm in that sentence?) But I am not one to be rude, so I am completely obliged. Although, I am going to follow suite and do what they did in changing the Meme slightly. I like this idea because it is more focused. 2. My favorite genre of adult books are autobiography, biography, and informational. 3. My favorite genre for Middle Grade and picture books is historical fiction and some realistic fiction (if it is funny). 4. I went to buy Christmas gifts at the the bookstore on Saturday and only bought gifts for myself. 5. My grandma used to buy me books as Christmas gifts I thought I would NEVER READ; I have read them all. 6. I love buying new books, but I also think it is really fun to find a brand new book at the library. I like to be the first to read a book. 7. I feel like I can never catch up on my reading, my pile is far too high as is my "I wanna read that" list. I was not expecting what I found behind the pages of The Entertainer and the Dybbuk by Sid Fleischman! This is a powerful book disguised with lots of humor. Until I began reading, I had no idea what to expect. I had never heard of a "dybbuk" (a Jewish spirit) so I did not, despite even looking at the cover (I didn't really look at it long enough), equate the story with the Holocaust. But that is exactly what the story is about. The main character, Freddie, was an American soldier in World War II. He is now living in Europe traveling as second-rate ventriloquist. Freddie meets up with the dybbuk who has a few things to teach him about the art of ventriloquy and even more to teach him about the Holocaust. Through Freddie, the dybbuk has a chance to right some wrongs, and to educate others about Jewish atrocities. The way Fleischman presents this seriously sensitive information is nothing short of amazing. The story is never boring and has a great humor to it. 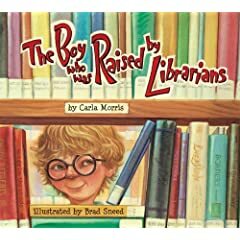 I am not sure it is exactly a children's book or Young Adult novel as it was placed in my library, but as an adult I thoroughly enjoyed the story. I would recommend it to a high school student, especially one looking for information on the topic of the Holocaust. From reading Sid Fleischman's Author Note, I can tell a lot of preparation went into this story. It contains a lifetime of knowledge and so much pain. I feel so good about reading it. 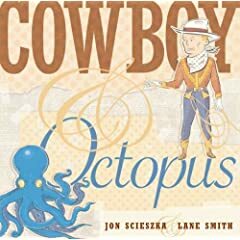 The unlikely friendship of a cowboy and an octopus creates a funny little picture book. Can't say there is much of a plot, but there is definitely a point. The theme I took from the book was friendship is a many splendid thing. What really makes the story is the illustrations! The illustrations are a mix of cut-outs and drawings. They are truly the best! This book could be a funny gift for a best friend in your life. I think anyone would be appreciative of the book's humor. If you have met a Scieszka-Lane picture book, you will not be disappointed or surprised. What a perfect gift for the librarian you know! It tells the heart-warming story of a boy who spends his days (and even a night) in the library. The librarians are always doting over him and helping him. The story follows the boy from childhood all the way to adulthood. It is just what you hope every library is like. Again, another book where the illustrations are PERFECT! I loved the way they librarians were portrayed and their characterizations exaggerated. This book is so special. I have never seen a book which represents the pride a child had for their parent in the services like this book does. I would purchase this book if I knew anyone who had a parent overseas serving our country. In the story the teacher has assigned the students to complete a project for President's Day. The project is to show patriotism in some way. Caleb, the main character, wrestles with what he could possibly come up with to show patriotism. He sees other student's ideas, but feels nothing he could do would be adequate. Besides, his father won't be there to see it any way. His father is serving our country. (You see where this is going?-- Me neither for some reason.) He decides to simply display a picture of his father. OH BRING ON THE TEARS... It was so touching. Of course everyone loved his display. How could you not? Lovely, simply, lovely.